Chances are you knew this was coming. Verizon officially announced yesterday their new Share Everything plan. It is a simplified plan that gives you unlimited minutes, and messages for up to 10 devices, as well as mobile hotspot with no extra fee. However, it also ends unlimited data as an option on new contracts and subsidized upgrades. So, is this a good thing, or a bad thing for the customer? Like all good questions, the answer is it depends. So basically $50 for the first GB, $10 for the second and $10 for every 2 GB after that. That is just the service, then you have to pay a line access fee for each device. The painful small print in this is the overage charge. If you go over your data limit on a given month, you get charged $15 for each GB. Discounting the added cost from 1-2 GB, that is three times the cost of adding 2 GB to go to the next level. This seems exceedingly punitive to me. Verizon has a calculator to help you figure out the best plan. The Share Everything Calculator let’s you enter your devices and get a recommendation. I looked at my account. I am cheap. I use little talk hours and no messaging (I get texts through Google Voice). Therefore my cost is $39.99 for 450 minutes, and $29.99 for unlimited data. A total of $69.98. Looking at my usage, I have actually never gone over 2GB. My max in the last 6 months is 1.4 GB. I don’t want to discount the likelihood that I may exceed this with a 4G phone, but a 2GB plan probably has zero impact on me (of course the overage charge would feel like an axe to me). Going with Share Anything, I would spend $40 + $60 for a total of $100. That is a $30.02 increase. However, I would also be getting unlimited voice (no value to me but a $30 add-on on my account), unlimited messaging (marginal value but a $20 add-on on my account) and would have mobile hotspot (something I could use and a $20 add-on). So for $100 I am getting what would cost me $139.98 in today’s world. IF I wanted the added features. Of course I would lose unlimited data. I could also add a tablet to my account for only $10 (though I would need to consider the data impact), and I could add a second phone, with unlimited voice/messaging for only $40. Before June 28th, I can get a subsidized upgrade to my phone, and keep my current plan, which would have no impact on my phone bill. I would have 18 months to decide if I want to buy my next phone at full price, or lose my unlimited plan. After June 28th, I can keep everything the same if I do not take advantage of a subsidized phone. If I take advantage of a subsidized phone, I can keep my minutes plan, and convert my data plan to 2GB plan for $30. A total impact of 12 cents a year + plus any data overages I might incur. Or I could move to the Share Anything plan that works for me. Welcome to the 21st century. Mobile phones are about data now, not voice minutes. When the cell phone companies added data to their phone systems it was just that, an add-on. The idea of unlimited data made a lot of sense to them. Now it is data first, and voice is not as important. Verizon will not be offering minute plans to new customers after the 28th. I wish the unlimited data plans would continue, but if you really look at the situation rationally, they can’t. Also, if you look at your actual usage, you may realize that with an unlimited data plan, you have been subsidizing other heavy users. For me, I will likely pull the trigger on the Galaxy SIII before the June 28th deadline. This will give me a full 18 months to assess the impact of the plan. However, I could actually see myself moving to the Share Anything plan before that if I finally break down and get a tablet with 4G access, or add my wife to my plan. We will see. It’s not the end of the world, heck, it’s not even the end of unlimited data on Verizon (you just can’t take advantage of discounted phones after the 28th). I don’t like it, but I understand it. Here is the news release. I can get a subsidized upgrade to my phone, and keep my current plan, ………………. I would have 18 months to decide if I want to buy my next phone at full price, or lose my unlimited plan. What do you mean [only] 18 months to decide? As long as you don’t get a subsidized phone from Verizon, you can keep your old plan [supposedly] forever, or at least until Verizon decides it wants to change that. And you don’t have to buy a new phone at all. You can just keep using the old phone, that is until it dies. Correct? Oh, and BTW, I think the plan is a rip off. The new plan will end up costing me $10 for having both my wife and me on the same plan with 2 smartphones and 2 GB of data, but we will be getting the unlimited minutes and texting we don’t need. I’m actually considering dropping my smartphone coverage (keeping my wife’s) which will end up saving me $30/month. I don’t think being connected all the time is a good thing anyways. I mean that by upgrading by June 28th, I get a subsidized price on my phone, and keep my current plan. 18 months from then, I will qualify for a subsidized phone again, and at that point could decide to buy a new phone at full price (keeping my unlimited plan) or buy a new phone with the subsidized plan and lose the unlimited plan. And, of course, you could just keep your old phone at the point, I just now my tendencies. 🙂 I’ll want the Octo-core 1 TB model with rollout widescreen display. Keep in mind that you would not necessarily need to pay the $10 to add a tablet — most tablets also have wifi connections and with hotspot tethering becoming a free part of the package (if you have a phone that supports it) that extra $10 could buy you an additional 2 GB of data. I think the author is a shill for Verizon. By offering excuses and claiming that the elimination of unlimited plans is somehow for the good of society, the author shows himself to be either uninformed or out of touch. The point of unlimited data plans was to provide predictable costs for network access. Now, one has to be concerned with rouge apps that flood the network with data and unexpected usage spikes that cost lots of extra money. These plans are going to increase costs for most consumers, since the so-called benefits of unlimited voice and text are used by a very small percentage of the user base. The only class of people who use unlimited text are teenage girls and young women. Please, find a more informed person who understands real world issues to write these articles. The current author just degrades your credibility. A. My pointing out that the data overage fee for going over the limit seems rather extreme? B. Was it my personal example of how the new plan would cost me an additional $30.02 a month? C. Was it my assertion that I would be getting a subsidized phone before June 28th to avoid the change? I tried to be balanced. I tried to point out the new plan does offer me more (though I countered that it was stuff I mainly didn’t want). I did praise the simplicity, I find current contracts rife with complexities that can make it difficult to compare one carrier to another. And I did say I liked the way they did change to shared data as we move to having multiple devices. My purpose was not to white wash the new plan (and I truly can’t see how anyone could read the post and think that) it was meant to lay out the options as clearly as possible. Sorry that you did not see that. Ironically, the reaction from folks on G+ and LinkedIn where I shared this post was mixed, but included folks who were truly pumped about the new option. A sampling includes “They will now get an extra iPhone sale from this household. We’ve been waiting for something like this.” along with “It seems to make them even more expensive for our use case, but I’ll have to go dig into it a bit more.” And I guess that is the point. You need to do your research and figure out what works best for you. I ran the numbers on the new plan, and for just ten dollars a month more than we pay now, we can go from 750 shared minutes to unlimited. We can go from 250 text messages each to unlimited. That will give us 6GB of data to share, and right now I have 4 with hotspot, and my wife has 2 without hotspot. We’ll get the same data amount between us, only my wife will now be able to Hotspot for no additional charge. Technically, since VZ charges $20, and our plan is only going to increase by $10, if she already had Hotspot going to this plan would actually save us $10 per month. Plus, my wife never uses more than 1GB, which means I’ll go from having 4GB to having 5GB. For us, it’s a good deal, and I’ll be switching to it on day one. Unlimited voice minutes will let me drop my home phone, saving me $30 a month, and more than offsetting the $10 increase in my cellular bill. @Julie Now that I have had more time to absorb the options, the only thing that really keeps me from going to Share Anything and adding my wife to my plan, is the overage charge. $15 is a big hit for going over. It’s a shame they couldn’t have some variant of roll-over data for the occasional overage. In Australia I pay $59/month for $550 worth of services ( calls, MMS ), SMS are free and I get 1.5GB of data. Data can be shared using a WiFi hotspot. One kicker is that going over your data is charged at $.15 per MB, so horrendous. @Ian lol. The PLAN is simpler. My explanation of the options faced to vzw customers going into 6/28, not so much. Yikes on the data overage. On the one hand, that works out to 153.60 per GB instead of $15, on the other hand you get charged the whole $15 for going even 1k over with the vzw plan. If you do not already have a 4G phone then you need to get one before 6/28 and activate it on your old plan. If you upgrade to a 4G after 6/28, even if you buy it somewhere else, Verizon will change you to the new plan and you cannot keep your old unlimited data plan. Also even after 6/28, be sure that you renew your old contract before it expires They are looking for any little thing to move you to the new plan. Go into the Verizon store and record your conversation with them when you need a new phone activated or do anything. Tell them you are recording the conversation. Don’t do anything by phone or online. They will change your plan and you will have no proof. Make them repeat on your recording that you are still on your old plan. I know someone who works for Verizon. The reps are getting bonuses for switching you! Actually just checked it’s $.25 per MB over your allowance but you can just buy data packs to compliment your allowance ( or load a data monitor on your phone/tablet ) . Higher $$ plans give you more call $s and data. You can also do the plan with a subsidised handset e.g. Subsidised 4GS+$550 calls+ 1.5gb data = $69/month over 24 month contract. 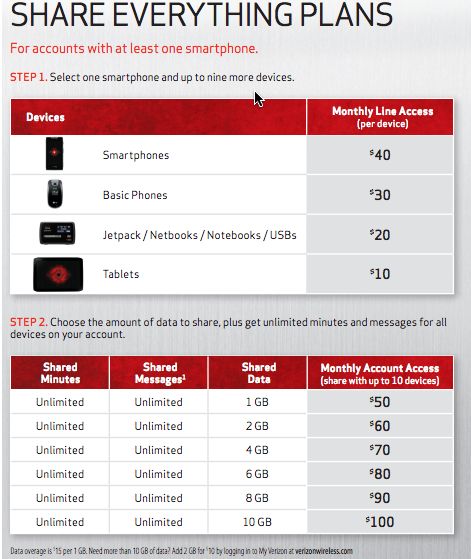 BTW, I have 5 phones on a Verizon Share plan and combined we use about 10-15 GB a month. My advice is if you want to keep your old plan. The old plan is much cheaper for us. @Dee to be clear 4g/not 4g has no impact. If you want to keep your unlimited data plan you can upgrade to a new phone with the subsidized price BEFORE 6/28. After 6/28, if you want to upgrade your phone you have to either pay the FULL unsubsidized price for the new phone, or lose unlimited. I understand that to mean that we had better switch out the 3G for 4G now before 6/28 or we will be switched to the new plan. 3G phones will become obsolete and will have to be upgraded at some point. One of my five phones on my plan is a 3G, so I am upgrading it now before 6/28. Hope that makes sense. @Dee Thanks for the link, that’s a good Android site, but A. That post was almost a month ago, before the announcement, and B. I’ve read it three times, and can’t see where it says anything beyond upgrading with a discounted phone will trigger losing unlimited. SO, according to Verizon, the only way to lose your unlimited data plan after 6/28 is to either choose to go to Share Everything, or take advanatage of a discount on a new phone. Even if your phone at the time is on 3G, if you pay full retail for the new 4G phone, you can stay on your exisiting plan. Also, as a reminder, if you DO want to buy a discounted phone after 6/28, you are NOT forced to got to Share Anything, you can choose to go with the $30 2 GB data plan. I hope this helps. Thanks for checking Bryan. But, I just got off the phone with a Verizon Rep and asked the same question. She said, “if you change from a 3G to 4G phone after 6/28, then your plan will change even if you pay full price.” It is because the equipment type is changing. I asked to her to check with her supervisor and she came back and said that is correct. She said to upgrade that 3G phone now before 6/28. I got her email address if you want it. I am changing now. Better safe than sorry! WOW!! The plans and the explainations are confusing! Guess I’ll be calling Verizon for help. I could never understand how people pay Verizon and AT&T those ridiculous prices anyway. Sprint and T-mobile are just as good for almost half the price. I tried to reach out to Dee offline, the Verizon rep I talk to categorically denied that what she says is true, and wanted to track down the rep that relayed the bad info, but I never heard back. Of course at this point, the time has passed, but I wanted to close the loop on that. Meanwhile I wait impatiently for my SGS III and my continuation for my UL data plan. if i terminate my old plan to switch this plan, will i get discount on smartphone?? we currently have 2 basic phones but want 2 smartphones and a basic phone. If your current contract is not up, you can switch to the new plan, get a discount on the phone you add, but not for switching out the basics IF they are still in the window. If one of your basic phones is older than 18 months, you should be able to upgrade it at a discount. Verizon lets you (or at least has let you) upgrade a phone at 18 months, even if it was a 2-year deal if you are continuing. Again, a verizon rep should be able to help you. Good luck. Sprint is entirely different than Verizon in certain areas of the country: the southwest, South and North Carolina to name only a few. I went round and round with Sprint who is perfectly fine with selling me a smart phone that has no service in certain areas that I visit frequently. I was blown away that that they did not care that I could get lost or be unable to call someone in an emergency in the desert. I was two days late in the contract renewal return period (14 days) because I was out there after being a 20 year customer. I will go with Verizon. They wanted me to prove I had moved to New Mexico to refund my money. I go out a lot but will not be moving. The word in Santa Fe is that Verizon is the only way to go. But I drop so many Sprint calls in Miami that it is worthless. I have to walk outside to use AT&T phones. Then there are the smaller companies that drop calls consistently. I finally found a reasonable person at Sprint and worked something out because I will be spending more time in Santa Fe and its environs. Look at Sprint’s coverage map. Then look at Verizon. Big dif. I would have had to buy a verizon phone for my time out there anyway just for safety. The 65+ plan that Verizon offers gets little mention but it is a good alternative for those on limited income.